My birthday bash is July 11! My birthday is coming up! I am going to be two on July 10th. I will have a public party on Saturday, July 11th from 10 – noon at Garrison Park on Manchaca Rd. in South Austin. Look around and you’ll find us. 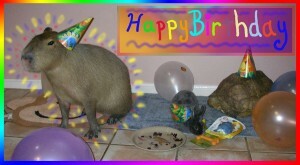 I’ll be the only capybara there. Here is a link to a map. As part of the celebration, my owner and I are donating $5 to the San Antonio Zoo for each copy of Celeste and the Giant Hamster sold during my birthday week (July 5-11). The money will be used to “adopt” one or more of their three capybaras. If you buy the book, please send me a photo of you reading it and wearing a birthday hat or eating cake or with some other symbol of a birthday celebration. I’ll post the photos here and next to the book on amazon.com. Thanks! And Happy Birthday to Me! My 1st birthday with my co-pets.